Pictured left to right: David Robinson, Managing Director Robinson Services and Rajesh Rana, Director Andras Hotels. A new hotel experience has arrived in Belfast with the opening of the eagerly anticipated Hampton By Hilton Hotel located in Central Belfast within walking distance of the fashionable Victoria Square shopping centre and many of the city’s attractions. The Grand Opera House and the Lyric Theatre are less than two miles away and you can walk to Great Victoria Street railway station for easy access around the city and the surrounding areas. After a busy day, unwind in your spacious room with a clean and fresh Hampton bed. Hampton By Hilton is a modern hotel with 178 bedrooms and family friendly facilities and only 15 minutes by car from Belfast City airport so this is the perfect place to stay for business or pleasure. 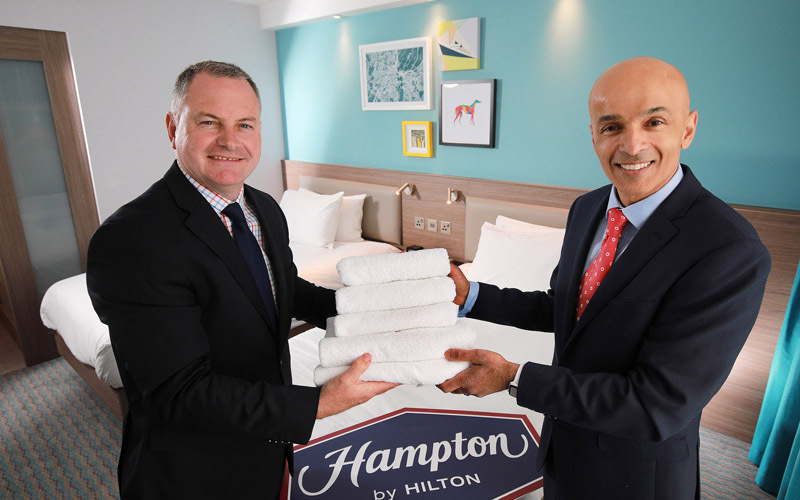 So it was delight all around at Robinson Services Laundry when they were selected to be the chosen linen supply partners for this exclusive hotel which is set to become a Belfast landmark.